BRAND NEW 'GENERATION INX' - CREATED BY TONI DARROCH - INTELLIGENT STAMPING FOR THE CREATIVE SPIRIT! Welcome to the NEXT GENERATION in crafting technology - intelligent stamping for the creative spirit! How can one ink pad offer so many creative options? Put simply: The colour is a high grade ink suspended in a formula designed to create multiple shades of a single colour. Why is the ink pad so different? It contains a cushion platform engineered for it's compression and absorption properties. 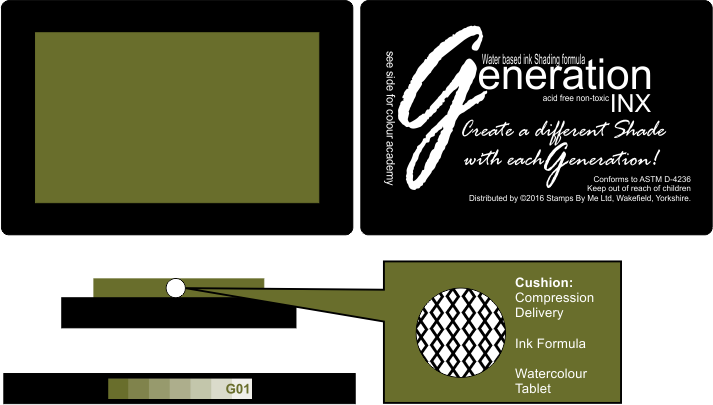 Combining this cushion with the ink formula creates an intelligent delivery system. 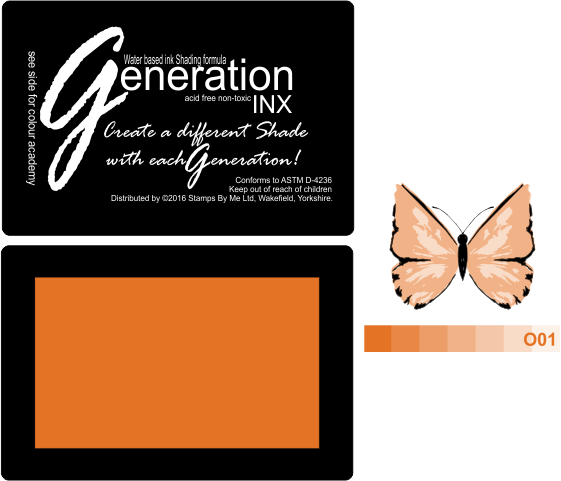 Once stamped on card the ink can be manipulated to create unique effects and finishes. The compression cushion clings to the etched detail on a stamp. Perfect for beginners. The compression cushion hugs the ridges of the stamp resulting in no missed areas. That's the end of that frustration! The system is entirely intuitive. That means you only have to pick it up and start using it to get the hang of it right away. The other benefit of such intuition is that the shading will be unique to you, your style, your creative spirit. Love watercolouring - LOVE G-INX! Manipulate the ink with water and take your brush straight to the tablet. The cushion and ink formula work together to produce fantastic watercolouring options. 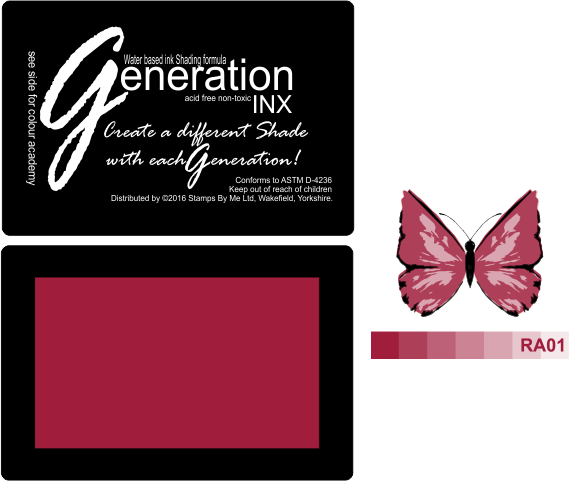 The colour academy chart shows the full range of shades that can be achieved using first, second and third generation stamping and the full range using watercolour techniques. The colour ranges have been created using different tones. 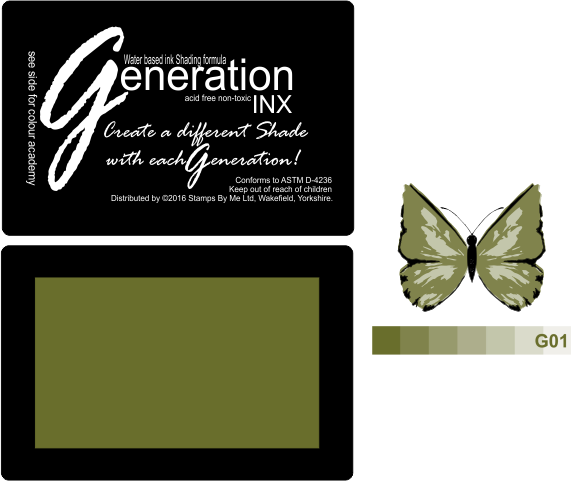 These are perfect for building up lighter and brighter shades using the generation stamping system along with water to achieve a unique finish. Volume 1 = Earthy Tones. Volume 2 = Floral. Volume 3 = Vibrant. Volume 4 = Vintage. Generation INX and Reinkers are the perfect ink to use with the Eureka 101 Tablet range.